Konata's the lazy otaku, too indifferent to study for exams, but always ready for an all-night raid. Kagami's the resident tsundere, quick with a comeback or a thwack to Konata's head. Tsukasa is Kagami's well-meaning sister, and Miyuki is the requisite ojousama, as graceful in speech as she is clumsy in action. Together, the four of them enjoy quiet days at their average school, eating snacks, talking about nothing much, and generally living out their teenage days the best they can. It's difficult to conceive of a show that better exemplifies “a product of its time” than Lucky Star. Airing just one year after the mega-hit The Melancholy of Haruhi Suzumiya, it was the first dedicated slice-of-life series by Kyoto Animation, a studio that would eventually build a top-class reputation in the genre. The specter of Haruhi hangs like a strange otaku cloud over Lucky Star; even though they have no formal narrative connection, Lucky Star's “heroine” Konata is a huge fan of Haruhi, with callouts ranging from simple references to sequences lifted directly from KyoAni's earlier project. Kyoto Animation feel like a character in their own show here, slotting in constant back-pats that come across as more labored than cheeky. The constant Haruhi references aren't the only elements that date Lucky Star. The show is an early paragon of anime's Seinfeldian “slice of life about nothing” comedies, and is often brought up (alongside K-On!) as one of the shows that best exemplifies “cute girls doing cute things” as a trend. But I think framing the genre in such a simplistic way ignores the complexity inherent to creating a strong slice-of-life show. And though its historical reputation endures, in looking back on Lucky Star, it most often seems like a reminder of what these shows shouldn't do. To me, good slice of life is generally based on a negotiation between two central goals: comedy and atmosphere. These two pillars can almost be seen as a spectrum; shows dedicated wholly to atmosphere tend to have fewer big gags, and shows that really lean into their comedy tend to not prioritize creating a stable world and tone as much. You can see the distinction between these two priorities in the contrast of Kyoto Animation's two subsequent slice of life shows: K-On! prioritizes atmosphere, with more light and incidental jokes, while My Ordinary Life is a much stricter comedy, and thus its world feels more like a setup for gags than a real place. Lucky Star falls somewhere between those two extremes, and unfortunately, it's not particularly good at either goal. 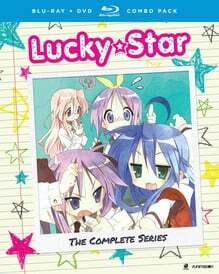 Episodes of Lucky Star proceed as rambling conversations between the four leads: Konata, Kagami, Tsukasa, and Miyuki. Konata is the otaku, Kagami is the tsundere, Tsukasa is Kagami's meeker younger sister, and Miyuki is the graceful ojousama. The four of them bumble through their days, conducting rambling conversations about the weather, favorite foods, their blood types, what they might do on vacation, and all manner of other topics. Lucky Star is almost impressive in its insistence on jokes not needing punchlines. Most of its conversations don't result in clear setups and endings; they just continue for a while and then end, or the show cuts to an unrelated scene at some undefined later point. Watching Lucky Star often feels like being trapped in an elevator as a group of strangers have a bland conversation around you - you can completely understand what they're talking about, but you already know this conversation is going nowhere, and you really just want your floor to arrive. The show does attempt actual jokes from time to time, but its preferred styles of humor are pretty unimpressive. There's a whole lot of reference humor, generally courtesy of Konata - but not only is everything very specifically dated to 2007, the references are also generally assumed to justify themselves. Having a character say “hey, remember Pani Poni Dash” isn't a joke - it might inspire a jolt of recognition in the audience, but there's no wit in simply acknowledging that another show exists. Even the more inspired pieces of reference humor (like a lengthy segment that visually apes the appearance of Initial D) are undercut by a character outright saying, “hey, what's with this Initial D-like driving sequence? !” Jokes are treated like cysts on the body of Lucky Star; when noticed, they are immediately lanced by another character's acknowledgment, thus draining the series of any potentially harmful humor. Lucky Star is also very fond of the classic low-key manzai setup; Konata will say something silly, then Kagami will say “hey, that's silly.” These also generally fail to be actual jokes - as is often the case in 4koma adaptations, the humor is generally just “this character said something mildly unusual,” which might make for a reluctant chuckle in the break room, but it isn't clever enough to justify itself in an actual comedy. The manzai setup only makes these non-jokes even less entertaining, since it generally means a mediocre joke concludes with another character outright explaining what about the joke was supposed to be funny. And some jokes are just outright aggravating, like the show's running gags about Konata's dad taking creepshots of high school girls or the occasional “Christmas Cake” jokes about their teacher's age. In short, Lucky Star is not a funny show, but slice of life shows aren't obligated to be funny - creating a warm atmosphere, a place where the viewer can relax at the end of a long day, is also a perfectly worthy goal. Unfortunately, Lucky Star's execution is very rarely up to the task of creating that space. The show's first four episodes, directed by Yutaka Yamamoto, almost feel phoned-in on purpose. These episodes contain the infamous “what's the right way to eat a chocolate cornet” conversation (where the characters spend almost half an episode having a conversation about nothing at all), but beyond the writing, there's just no enthusiasm in the show's direction or animation. The show proceeds as a series of mid-distance shots of talking heads, disjointed conversations that simply begin and end, then find themselves replaced by other disjointed conversations. The backgrounds and character designs are both very simplistic, the shots are all framed in the same neutral way, and there's no dramatic continuity between any of the conversations. These episodes truly feel like a sequence of animated 4koma panels in the worst possible way. Yamamoto was eventually replaced by KyoAni veteran Yasuhiro Takemoto. Takemoto is a better director and a clear fan of comedy (his other works include Full Metal Panic: Fumoffu and Amagi Brilliant Park, and Hyouka), and his presence does manage to add a bit more life to the episodes. Sequences like the group's festival visit or trip to the beach have a greater sense of place than the early episodes; there's a diversity of camera angles, a scattering of scene-setting pillow shots, and jokes are set up visually as well as in the dialogue. But for the most part, even Takemoto's material seems like a remarkable step down from the majority of Kyoto Animation's output. There's none of the environmental focus or animation highlights that make productions like K-On! feel so expansive and lived-in, only a series of superdeformed talking heads sliding up and down in a pantomime of walking, as they discuss the best way to win a mail-in sweepstakes prize. The show seems to almost make a point of refusing to let its world feel real; choices like the decision to give all the background students interchangeable middle-aged voices feel like an overt nose-thumbing at the concept of tonal coherence. Even the music feels absolutely minimal; it's largely just simple melodies on synth and xylophone, repeating progressions timed to the rhythm of the dialogue. The show has precisely two moments that strive for any more emotional complexity than “I did badly on a test” - one scene where Kagami and her sister have a small fight and another where Konata's absent mother reflects on her family's current life. Perhaps a few more moments like those might have turned the cast into characters worth caring about. There are some occasional bright spots here and there. The show has a recurring gag about a group of hot-blooded shopkeepers that completely jettisons the show's usual style, instead adopting a visual aesthetic similar to G Gundam. Those sequences have visual style, animation, timing, and actual punchlines - the joke is always “these hot-blooded shopkeepers can't get Konata's attention,” but at least those sequences are fun. The show's standout feature is the episode-ending Lucky Channel, where “super idol” Akira Kogami and her assistant Minoru Shiraishi go over fun facts about the show proper. Lucky Channel feels like a show apart from Lucky Star, possessing basically all the snappy comedy and character-building charm the main show lacks. The central gag is “Akira's sunny idol persona hides a jaded professional, who Shiraishi must do his best to suffer under,” but the segment mines solid comedy out of the chemistry between the two. As the show continues, Shiraishi ends up getting larger and larger bit parts in the main show, meaning Akira gets more and more pronounced in her jealous abuse. Lucky Channel stuffs more effective punchlines, endearing repartee, and actual character development into its two minute runtime than the actual show manages in twenty. This release marks Lucky Star's first time available on bluray, but it's unfortunately a pretty lousy transfer. The bluray comes across like an obvious upscale; instead of smooth lines, it's dominated by constant jagged edges, like an image that's been enhanced beyond its initial resolution. Fortunately, this release is also packed with some nice extras; there's a live video taping of Lucky Channel, a strange promotional event starring Lucky Star-themed race cars, and a forty-minute OVA. That OVA is also better than the main series, likely because it covers a series of narratives instead of disjointed gag conversations. Short segments of Kagami being taken to a dream-ball by Konata, or Tsukasa working to live up to her sister's image, hint at a better Lucky Star that could have been. You can't just transfer 4koma gags directly into animation and call it a day; adaptation of material like this requires the ability to grasp the emotional or comic heart of a work, and then convey that heart in a style appropriate to a more aesthetically ambitious medium. The extras don't end there. The last of the bluray additions are an on-screen text reference guide (where you can check out the translations of any larger blocks of text the normal subtitles didn't cover) and the clean opening/ending, but there's also an additional DVD dedicated entirely to more bonus features. There's a gallery of key scenes from the show, a series of rambling adventures starring the real-life Minoru Shiraishi, and a three-part interview with the English cast. As usual, those interviews offer a variety of neat insights into the show's production process - they're staged more like traditional interviews than the disjointed tidbits of info you tend to get from a commentary track, meaning you get neat moments like Wendee Lee discussing Cowboy Bebop's influence on both her own career and the general reception of dubbed productions. Lucky Star's dub is a perfectly reasonable adaptation, though the show's lethargic conversational pace can make some sequences feel a little stilted. A great deal of the show's comedy is drawn from the specific pacing beats of the characters' conversational flow, meaning that something will necessarily get lost in translation at some point. But the cast match their characters well, and the show even goes the extra mile of dubbing the banter that's mixed into the first half's ending karaoke songs. It's a solid dub on the whole. Overall, while I found Lucky Star somewhat interesting as an industry time capsule, I had great difficulty extracting much entertainment from the experience. The show relies heavily on the laziest and least compelling forms of anime comedy, from simplistic reference humor to lukewarm manzai back-and-forth. The middling execution means there's no real sense of place, either - the only things that feel "real" are the central characters, and those characters are static and not particularly endearing. Lucky Star may have been influential, but it has been surpassed by the shows it originally inspired. Some shows are best left in the past.